New Nottingham Forest boss Billy Davies says his first task is to instil confidence in his "under-achieving" squad but still thinks promotion to the Premier League is possible this season. Davies was last week appointed Reds boss for the second time and officially took up his new role on Monday. "We have an under-achieving squad and we have an abundance of talent. I will try to give them belief," Davies said. "There is so much more they can do. They know the quality they have." Forest are six points off the play-offs with 15 games to go in the Championship season. But Middlesbrough, who occupy the last play-off place, also have a game in hand and Crystal Palace in fifth spot are 11 points ahead of Davies' side. 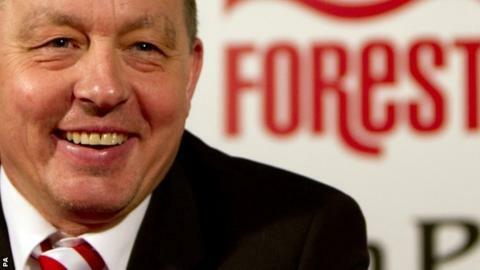 Davies, who is Forest's fourth manager in just under seven months, has no doubt he has real quality within the squad. The 48-year-old Scot said the squad was stronger on paper than when he left 20 months ago and believes that the club have the infrastructure in place to realise the dream of returning to the top flight. "We will try to work off the same page," he said. "It's all about believing in what you are trying to do. "We will try to lift the spirits, we will look at the loan market and if we need to bring in one or two then we will. "There is a huge difference [at the club from his last spell]. There are new owners and it's a whole new ball game. Having dealt with people I am very confident in the chairman and people here to move this club forward." Davies said chairman Fawaz Al Hasawi and the board has not put pressure on him to go up this season, but did insist that "anything was possible" and that remains the goal, either in this campaign or the next. "We should take this football club to where we think it belongs," Davies continued. "That's certainly the ambition of the owners and me. "I am very confident, having spoke to Fawaz and the board, that these people are very ambitious and will do all they can to get the club to the Premier League. "There has been no mention of promotion or any level where we have to get to. We will try to win the next game and try to do the same again after that." And Davies was also quick to dismiss any talk of interference in team matters by the Kuwaiti owners. He said: "Do you think I would be here [if that happened]? I am looking forward to working with Fawaz and the board. "The chairman has great respect and great understanding of the structure of the football club and I know together, if it's possible, we will bring in the right type of players to move this club forward. "You have your discussions. I am not a fool. I may speak to the chairman regarding players. If some people are asking too much we know that common sense prevails. We will try to find the right type that fits into the right financial package for the club. "But that might not be necessary. We are still assessing the squad, assessing everyone at the club, the way the club is functioning and looking at many factors."